Jsonics 0.2.0-alpha contains a bunch of new features and gets us a lot closer to being ready for our first release. Jsonics has been moved to .net Standard 2.0. This allows for a much broader api space and will be supported everywhere .net is. Jsonics now supports .net fields as well as .net properties. Char support was missing in the last release and has now been added. Decimal support was missing in the last release and has now been added. The Jsonics.StrongName packages has been unlisted and will not get any further updates. The Jsonics package is now StrongNamed. However the assembly version will be frozen to the major version in order to remove the need for Binding redirects. The File Version and Package version will now follow SemVer 2.0 rules. It was necessary to remove the Jsonics.StrongName package to avoid the situation where two libraries have a dependency on on Jsonics one using the StrongName version and one using the standard version. The code is available on github here under the MIT license. Jsonics is currently in alpha quality and should not be used for production code. However feel free to try it out and report any issues you have with it. Over the past months I have been working on a new opensource Json library for .net called Jsonics. I am now pleased to announce its first release 0.1.0-alpha. Jsonics is a high performance Json Library for c#. Jsonics stands for JSON In C Sharp. Jsonics aims to be as fast as is possible in scenarios where the same type will be serialised or deserialised many times. Jsonics uses runtime code generation and other advanced techniques to create an optimal serialiser and deserialiser based on the supplied type. Nearlly all Json parsers claim to be the fast. Here are some claims by popular .net Json libraries. Jil aims to be the fastest general purpose JSON (de)serializer for .NET. I don't want to make any claims about speed. These tend to either be proven wrong or to fail to age well. 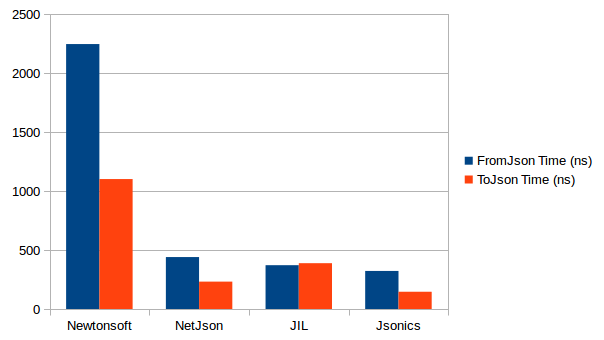 However Jsonics does have a focus on speed and currently performs well in relation to other .net Json libraries. The following is a benchmark created using the awesome BenchmarkDotNet library. I have uploaded the benchmark code to github here if you are interested in details. Please bare in mind that performance is very dependent on your use case, so it is best to benchmark with your own workload before choosing a library. Jsonics has support for most commonly used .net types. If you find a type you need is missing please raise an issue and I will add it. Jsonics is available on Nuget in both Signed and Unsigned versions. New history bible book category and missing books from poetry section. Added bible module copyright to about info. Improved error handling and retry on bible module install. Right now we need lots of testing done to ensure that this release candidate is ready for release. I want to say a big thank you to all the people who contributed to this release to make it possible. Wide Margin is free and opensource and is produced entirely by volunteers. Wide Margin is available for Ubuntu and Windows destkop. Browse button for passage navigation added to the top bar. Menu icon updated to be more recognizable. Fixed menu placement on dual monitor when maximized. Right now we need lots of testing done to ensure that it is ready for release. I want to say a big thank you to all the people who contributed to this release to make it possible. Wide Margin is free and opensource and is produced entirely by volunteers. Wide Margin is available for Ubuntu and Windows destkop. I am pleased to announce the release of Wide Margin 1.2.11 Beta the free and opensource bible application for Ubuntu and Windows. Wide Margin 1.2.11 Beta include bugs fixes as well as a 'Open Link in New Tab' menu item for those times you don't have a mouse. 'Open Link in New Tab' menu item. Right now we need lots of testing done to ensure that it is ready for release. I will be organizing a testing evening in the next few weeks. I want to say a big thank you to all the people who contributed to this release to make it possible. Wide Margin 1.2.9 Beta includes search and passage rendering improvements as well as bug fixes for the windows version. Show search results for book names which also match passage content. Highlight search terms in search results. Wide Margin 1.2.7 Alpha 2 includes a much improved passage text layout with headings, module references and note support. On windows the GTK UI has been replaced with a native windows user interface using WPF. I want to say a big thank you to all the people who contributed to this release to make it possible. Wide Margin is free and opensource and is produced entirely by volunteers. New contributions are welcome. Even if you can't code you can contribute by testing, raising bug reports, contributing artwork and mock-ups.